Emeric Pressburger (5 December 1902 – 5 February 1988) was a Hungarian British screenwriter, film director, and producer. He is best known for his series of film collaborations with Michael Powell, in an award-winning collaboration partnership known as the Archers and produced a series of films, notably 49th Parallel (1941), The Life and Death of Colonel Blimp (1943), A Matter of Life and Death (1946, also called Stairway to Heaven), Black Narcissus (1947), The Red Shoes (1948), and The Tales of Hoffmann (1951). Imre József Pressburger was born in Miskolc, in the Kingdom of Hungary, of Jewish heritage. He was the only son (he had one elder half-sister from his father's previous marriage) of Kálmán Pressburger, estate manager, and his second wife, Kätherina (née Wichs). He attended a boarding-school in Temesvár, where he was a good pupil, excelling at mathematics, literature and music. He then studied mathematics and engineering at the Universities of Prague and Stuttgart before his father's death forced him to abandon his studies. Pressburger began a career as a journalist. After working in Hungary and Germany he turned to screenwriting in the late 1920s, working for UFA in Berlin (having moved there in 1926). 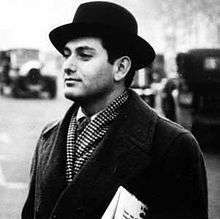 The rise of the Nazis forced him to flee to Paris, where he again worked as screenwriter, and then to London. He later said, "[the] worst things that happened to me were the political consequences of events beyond my control ... the best things were exactly the same." Pressburger entered Britain in 1935 on a stateless passport; once he decided to settle, he changed his name to Emeric in 1938. In England he found a small community of Hungarian film-makers who had fled the Nazis, including the influential Alexander Korda, owner of London Films, who employed him as a screenwriter. There he met film director Michael Powell, and they worked together on The Spy in Black (1939). Their partnership would produce some of the finest British films of the period. On 24 June 1938, Pressburger married Ági Donáth, the daughter of Andor Donáth, a general merchant, but they divorced in 1941. The union was childless. He remarried, on 29 March 1947, to Wendy Orme, and they had a daughter, Angela, and another child who died as a baby in 1948; but this marriage also ended in divorce in Reno, Nevada in 1953 and in Britain in 1971. His daughter Angela's two sons both became successful film-makers: Andrew Macdonald as a producer on films such as Trainspotting (1996), and Kevin Macdonald as an Oscar-winning director. Kevin has written a biography of his grandfather, and a documentary about his life, The Making of an Englishman (1995). Pressburger became a British citizen in 1946. [N 1] He was made a Fellow of BAFTA in 1981, and a Fellow of the BFI in 1983. Pressburger was a diffident and private person who, at times, particularly later on in his life, could be hypersensitive and prone to bouts of melancholia. He loved French cuisine, enjoyed music, and possessed a great sense of humour. In appearance he was short, wore glasses, and had a sagacious, bird-like facial expression. He was a keen supporter of Arsenal F.C., a passion he developed soon after arriving in Britain. From 1970 he lived in Aspall, Suffolk and he died in a nursing home in nearby Saxtead on 5 February 1988, due to the complications of old age and pneumonia. He is interred in the cemetery of Our Lady of Grace Church, Aspall. His is the only grave in that Church of England graveyard with a Star of David. 1957: BAFTA Award nominated for The Battle of the River Plate as Best British Screenplay. Shared with Michael Powell. 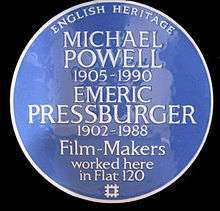 2014: An English Heritage Blue plaque to commemorate Michael Powell and Emeric Pressburger was unveiled on 17 February 2014 by Martin Scorsese and Thelma Schoonmaker at Dorset House, Gloucester Place, London NW1 5AG where The Archers had their offices from 1942-47. Pressburger's early films were made mainly in Germany and France where he worked at the Ufa Studio in the Dramaturgie department (script selection, approval and editing) and as a scriptwriter in his own right. Some of the films made in Germany have French titles and vice versa. In the 1930s many European films were produced in multiple-language versions. In 1932–33, when the Nazis came to power, the head of Ufa decided to get rid of all Jews so Pressburger was told his contract wouldn't be renewed. He left his Berlin apartment, "leaving the key in the door so that the Stormtroopers wouldn't have to break the door down" and went to Paris. Late in 1935, Pressburger decided that he would do better in England. (Remember that film scripts are written some time before the film is made and released, so some films that he worked on were released in France some time after he left). In 1939, Pressburger was introduced to Michael Powell to work together on The Spy in Black. They had an instant rapport and went on to make 20 films together in less than 20 years, many of them highly regarded. But even while he was working with Powell, Pressburger still did some projects on his own. It is worth noting that Pressburger wasn't just "Michael Powell's screenwriter" as some have categorised him. The films they made together in this period were mainly original stories by Pressburger, who also did most of the work of a producer for the team. Pressburger was also more involved in the editing process than Powell, and, as a musician, Pressburger was also involved in the choice of music for their films. Powell and Pressburger began to go their separate ways after the war. They remained great friends but wanted to explore different things, having done about as much as they could together. Two of Pressburger's later films were made under the pseudonym "Richard Imrie". Novel: The Glass Pearls. London: Heinemann, 1966. ↑ Note: (for categories): He became a British citizen; you can only be English by being born there. 1 2 "Pressburger Addresses." powell-pressburger.org. Retrieved: 19 August 2010. Christie, Ian. Arrows of Desire: The Films of Michael Powell and Emeric Pressburger. London: Waterstone, 1994, First edition 1985. ISBN 0-571-16271-1.